After last week’s Sleeplessness post I tried to make some serious changes to my bedtime routine. Thank you, by the way, for all of your amazing comments – I was really rather touched that so many of you took the time to share your experiences and give advice. And as last week’s post was so well-read, I thought it might be interesting to jot down my sleep patterns. If only to help those of you who find it difficult to nod off: BECAUSE IF READING THIS POST DOESN’T KNOCK YOU OUT THEN NOTHING WILL. Right-o, here’s what time I went to bed, what I did before bed (stop it) and what time (approximately) I got to sleep for every night of the past week. There’s something a bit narcissistic about these online diary things: I for one love reading them (especially food diaries, for some reason) but I understand if you feel like telling me to sod off. The rest of you – the voyeurs and devourers of online journals – enjoy. I started this a week ago and finished it (late) last night. Sunday: after imposing a new “no work after 7pm” rule, I – amazingly – managed to stop work at 6.30, put the baby to bed and not watch any television, making a conscious effort to potter about without any electronics. I even shunned my Kindle in favour of a paperback so that I wouldn’t think about iPads and therefore laptops and therefore work, and I left my iPhone in the living room. I fell asleep at about 10.30 after massaging my feet with that Uma oil from Cult Beauty and – quite literally – slept like a log. One wake-up to feed the baby at 2am, but straight back to sleep and woke up very refreshed at just after 7am. Monday: no work after 7pm – tick. In bed by 9.30pm, but we watched an episode of Ray Donovan (new television obsession, oh my God) and turned the lights off at 10.30pm. The dog woke us up at about 3am, then the baby at 4am, but overall it wasn’t too bad. Tuesday: I worked until 8.30pm, trying to finish off some video editing. I should have been more organised in the day, but time just slipped through my fingers. Made a curry and we ate that at 9pm, I can’t go to bed straight after eating so we had a mini Magnum (healthy!) in front of an episode of Ray Donovan. OK, two episodes of Ray Donovan. 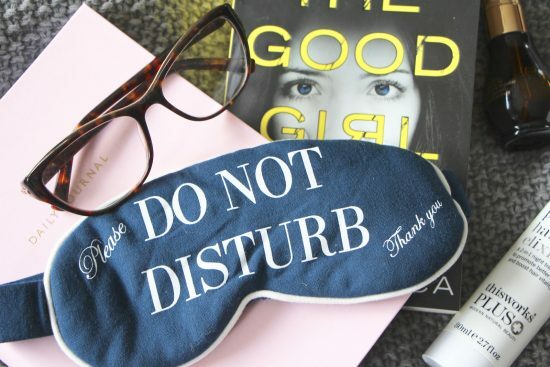 Bed at 11pm – I tried to read for a while from my paperback, but it was scary (The Good Girl) and also not that good and so dropped into something of a fitful sleep at around 11.20pm. Up for a feed at 3am, back to sleep until 7.40am, woke up a bit groggy. Wednesday: Mr AMR didn’t get back from his shoot until 8pm, then we chatted until about 9pm (I had already eaten) and decided to retire to watch – you guessed it! – Ray Donovan snuggled up in bed. (We have a telly bed. It’s ridiculous and also amazing.) At 11pm Mr AMR got an email from a client (must have been in the US) asking for a photograph they wanted to use so he got back up to find it and transfer the file. At 11.30pm the baby woke up with teething pains, I got her back to sleep at about 12.15am and then went and slept in the spare room next to her nursery because I was anxious about her. Slept straight through until 7.15am, which is a LONG uninterrupted period of time in my sleep world! Thursday: Mr AMR stayed in London after work and so I was home alone and ended up working from 7.20pm, when the baby went to sleep, until about 11pm. Ooops. I lay in bed until about 12.30am Googling miniature bathtubs for my dolls house, then I was too scared to turn the light off and also had the dog on the bed with me as protection (don’t judge) so didn’t get to sleep until around half past one. At two thirty the baby woke up then I slept fitfully until five when I turned the light off because it was starting to get light outside which means that demons can’t get you and then I went back to sleep until half past seven. Phew. A bit of a failure in terms of my new sleeping regime, but at least the lamp kept the vampires/trolls/girl that climbs out of the well in The Ring/zombies away. So there. A week of bedtimes. In summary, I think we can all agree that Ray Donovan single-handedly sabotaged my good intentions with regards to establishing a good sleep routine. I’ll add it to his list of crimes (framing his own father for murder, drink driving, sleeping with a psychotic blonde when his wife is at home worried about him, shooting a priest through the head, to name but a few). If you don’t have a clue what I’m on about then you can watch it on Amazon Prime. I’ve had Prime for too many years to even count, but only recently realised I could watch films and TV programmes on it. You can usually get a free trial for 30 days – enough time to watch all of the Ray Donovan episodes! After that it’s £79 a year – used to be about forty quid, if I remember rightly, but at that time it was just about getting free next day delivery and they didn’t have all of this new-fangled streaming stuff going on.. Oh, the innocent days of yore! The Amazon Prime page is here.